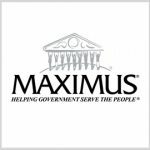 Maximus (NYSE: MMS) cut its revenue forecast for the government health and human services contractor’s 2016 fiscal year ending September 30 on an expectation of continued weakening in the U.K.’s pound since Britain’s June 23 vote to leave the European Union. Reston, Virginia-based Maximus now expects sales in the $2.37 billion-$2.4 billion range from the previous $2.4 billion-$2.5 billion outlook but also lifted the bottom end of its earnings forecast to $2.60 per share with the ceiling unchanged at $2.70. The GovCon Index-listed company — which runs its fiscal calendar on an October-September basis — is the main contractor on a multi-year program in the U.K. to help assess applicants for health and disability benefits. Second quarter earnings came in at 74 cents to exceed Wall Street’s forecast of 71 cents and net income rose 24.85 percent year-over-year to $52.75 million in part on the company’s sale of its K-12 education business. Revenue increased 7.82 percent from the same April-June period in FY 2015 to $617.09 million versus analyst expectations of $625.07 million on ramp-up of a contract with the Education Department and contributions from the U.K. assessment program. Including adjustments for currency fluctuations, sales would have increased 10 percent from the same period last year. As of Wednesday’s close, shares in Maximus are up 2.77 percent on a year-to-date basis and down 14.97 percent for 12 months. The GovCon Index has added 8.06 percent since the start of 2016.